September 9 | 2018. 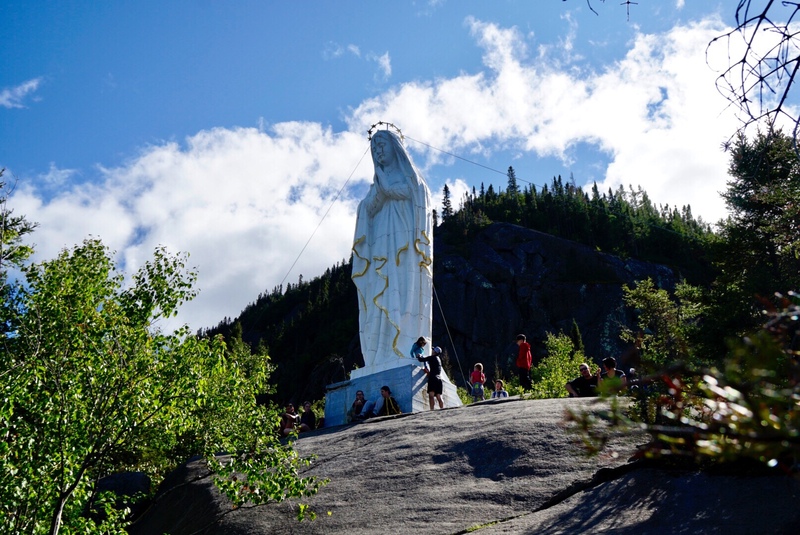 The Virgin of Notre Dame-du-Saguenay. | Peter M. Schloss | J.D. - Mediator. September 9, 2018. The Virgin of Notre Dame-du-Saguenay. In 1878 Quebec City merchant Charles-Napoleon Robitaille was traveling upon the frozen Fjord-du-Saguenay when the ice broke. He along with his horse and sleigh were cast into the freezing waters. Charles prayed to the Virgin Mary that his life be spared. He survived, but as the horse was not a believer it perished (sorry, small joke!). Charles soon became deathly ill from his experience in the freezing waters. He again prayed to the Virgin Mary, this time asking for 10 more years of life in order to raise his children and provide for his family. He again lived. Charles vowed to create a monument to his two miracles. Thus he engaged the services of sculptor Louis Jobin. Using three huge white pine logs, Louis carved a statue of the Virgin Mary that was to stand nearly 30 feet tall. While transporting the statue on the Fjord, it fell from the boat into the waters. Fortunately it floated. The three sections were towed 15km by rowboat to a location beneath the cliff of Cape Trinity where it was to be installed hundreds of feet above the Fjord. The local 19th Century technology proved inadequate for the task, so 19th Century ingenuity was employed. The 6,000 pound statue was cut into 14 pieces and each piece was hoisted up the cliff where they were reassembled and covered with thin lead sheathing for protection from the elements. The Statue has stood overlooking the Fjord from the point of Cape Trinity since 1881. Tradition calls upon mariners who pass the Cape to slow their vessels and sound their horns in honor of the Virgin Mary and the memory of Charles-Napoleon Robitaille. Reaching the statue by land is a moderately challenging 5 mile hike that involves a total assent of 1,500 feet. Allowing for some contemplation time along the way and at the top, the round trip takes about 3 hours. 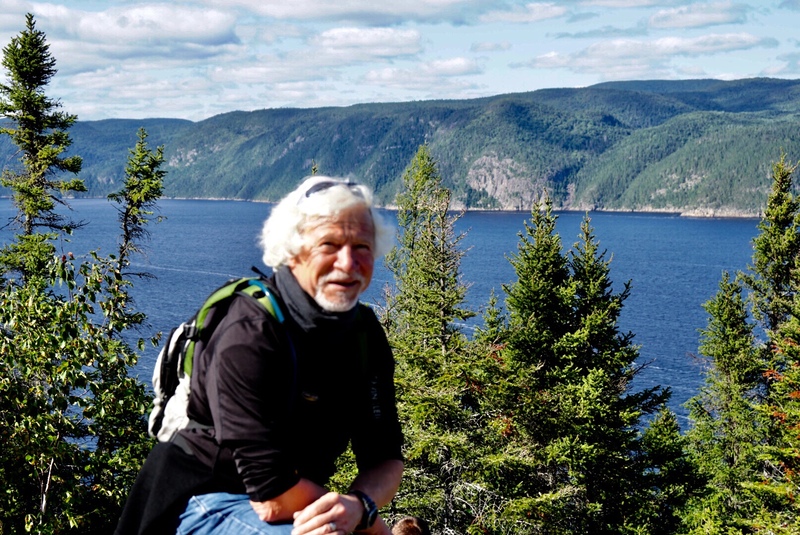 This trail is a part of the final section of the 215km pilgrimage walk that is presented in 14 sections from Saguenay Lac-Saint-Jean to the Notre Dame du-Saguenay statue. Each section has a different spiritual theme. Please enjoy these pictures of my experience upon the trail to the statue. Tomorrow we continue our journey northeast along the shores of the St. Lawrence. Another awesome fete. I am learning so much from all your posts. …and you are proving that one is never to young at heart to learn. Wow Maxine. I would have never known! Thanks!!! My eye was immediately drawn to “Compostela” on the sign!! Perhaps another walking trail to be put on the list!! The thought crossed my mind too.